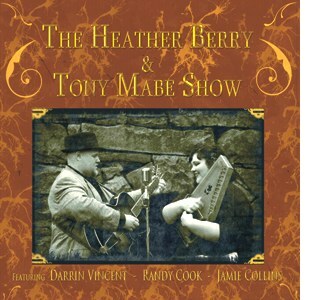 We want to let everyone know that Mountain Fever Records will be releasing "The Heather Berry & Tony Mabe Show" self titled CD on Feb. 14th. Geoff Morris a distinguished DJ from Australia will be offering up the world premier of the record this coming Monday night on the WWB where he hosts a show every Monday night. Geoff has long been a huge fan of Heather Berry. As Geoff told me a couple weeks ago, "Heather is one 3 people that I could thoroughly enjoy listening to them just read a phone book". Someone from Mountain Fever will be in the chat room during the show giving away CDs among other things.